Currently running from 2013 to 2018, the UK Regenerative Medicine Platform (UKRMP) was established by the Biotechnology and Biological Sciences Research Council (BBSRC), Engineering and Physical Science Research Council (EPSRC) and Medical Research Council (MRC) to address the technical and scientific challenges associated with translating promising scientific discoveries in this area towards clinical impact. Whilst great strides have been achieved thus far, to further promote the development of regenerative therapies the sponsors are now establishing ‘UKRMP2’ which will continue to address key challenges and opportunities in regenerative medicine with support from 2018-2023. As such, the sponsors are now inviting proposals to establish high quality, collaborative research groupings to establish UKRMP2. NB: The full call text and accompanying application guidance are both available as PDFs for download. Regenerative medicine is an interdisciplinary field spanning tissue engineering, developmental and stem cell biology, gene therapy, cellular therapeutics, biomaterials (scaffolds and matrices), nanoscience, bioengineering and chemical biology. It seeks to repair or replace damaged or diseased human cells or tissues to restore normal function via the transplantation of stem cells, progenitors or tissues, activation of endogenous repair processes, using cells as delivery vehicles for therapeutic agents and or engineered cells/synthetic biology. Regenerative medicine has already provided significant medical advances in areas such as skin regeneration for burn patients and diabetic ulcers, and the treatment of anaemia. It still has the potential for further advances, with next-generation products offering the prospect of treatments with long term benefits or cures across a wide range of debilitating illnesses. The underpinning science is progressing rapidly, yet there are a number of translational challenges which still need to be overcome before these promising discoveries can be progressed for the benefit of patients as well as the UK economy. The UKRMP initiative was established by BBSRC, EPSRC and MRC to address the technical and scientific challenges in regenerative medicine and promote the widespread delivery of therapeutic approaches. Running from 2013 to 2018 the Platform has successfully established a broad-based, but coherent, interdisciplinary programme that is making inroads into the key challenges. Whilst great strides have been made towards overcoming these challenges, the barriers to delivery of regenerative medicines have not yet been overcome, nor was it imagined they would be within the scheduled timeframe for the initial phase of funding provided to the UKRMP. Having taken stock of the advances that have been realised thus far, and changes to the scientific landscape in the area over the past four years (see below), the sponsors are now inviting proposals to establish high quality, collaborative research groupings for Phase 2 of the platform (UKRMP2). This will be manifested through an evolved Platform structure with facets vital to all aspects of regenerative medicine embedded as cross cutting elements, i.e. common within all Hubs, to more fully realise the impacts from investments in UKRMP Phase 1 and to continue to accelerate these therapies towards clinical application. The call for UKRMP2 follows the Challenge Ideas consultation process held in August 2016. The consultation provided an opportunity for interested parties to highlight scientific areas and generic technologies and platform approaches that would significantly advance the overall mission of the Platform in its next phase. These were assessed by an Expert Panel involving both UK and international experts and used to inform the key requirements and remit for this call. The sponsors wish to continue to support a high-risk, innovative and interdisciplinary approach, ensuring that current momentum is built upon and effective collaborations are maintained, while drawing in new partners to further increase capacity and expertise and retain the UK as one of the global leaders in this rapidly advancing field. This call will fund up to three interdisciplinary research Hubs that bring together teams of researchers to address a number of strategically important, tractable challenges on the path towards translation. It is anticipated that one award will be made in each identified thematic area, subject to quality (see Hub Themes below). Hubs will be based on critical mass of scientific excellence required to address key developmental challenges for the thematic area, supported by the appropriate governance structures and leadership to drive forward a globally leading and agile programme of research. The research programme should be ambitious, creative and innovative addressing key research challenges. UKRMP2 Hubs should develop approaches that have broad applicability. Organ or disease-based exemplars will be required to provide a level of focus and proof of concept; however, they should not constitute the primary focus of the submissions. Applicants will be required to justify their choice of exemplars. Priority will be given to Hubs with exemplars which are more likely to be ready for clinical evaluation at the end of this phase of funding. A number of cross-cutting themes have also been identified of relevance to the whole Platform, which all successful Hubs will be expected to incorporate appropriately in their proposal. These include; quality control, safety, manufacturing and immunological considerations. Further opportunities to build on the capability and connectivity of the funded Hubs will be launched once the portfolio and remit of Hubs is known. It is expected that funded Hubs will act as UK leaders in their area and will self-organise to maximise opportunities for networking and team science for the benefit of the UK as a whole. assemble the best possible combinations of skills from across the academic, clinical and industrial landscape. Teams will be expected to have a proven track record, relevant skills and the leadership required to deliver the Hub and Platform ambitions; co-applicants may include international partners where appropriately justified. include strong plans to facilitate engagement with (bio)industry and end-users outside of the hub. The pathway to impact for this type of research in health is often longer and more complex than that seen in other sectors. Given this, there is a need for researchers working in this area to consider more carefully how they will undertake their work in a manner that maximises the opportunity for impact to arise from it. Applicants must consider which impact and translation topics relate to their proposed programme of work and, if they are relevant, describe in their Pathway to Impact document how they will be addressed throughout the award. There is no expectation that researchers will undertake all impact activities themselves nor is there an expectation that researchers will develop extensive expertise in all areas. However, applicants should consider what skills, knowledge and expertise are required and how these will be brought to the project through collaboration, training, consultation or other means. Understanding of the pathway to impact in health and the incorporation of appropriate and specific impact activities will form part of the assessment of proposals. A well-considered and appropriately resourced Pathways to Impact plan will be seen as a considerable strength. demonstrate an understanding of the future development pathway for their proposed research and show that they have considered the likely next steps for the outcomes of their research. Applicants should consider how they will obtain, during the project, any data, evidence, proof of concept and/or intellectual property needed to satisfy the next stage funder that it is a suitable prospect for follow-on support. the engineered cell environment – addressing the niche, activation of endogenous regenerative process through small molecules or biologics, and the role of extracellular matrix and cytokines in promoting repair. 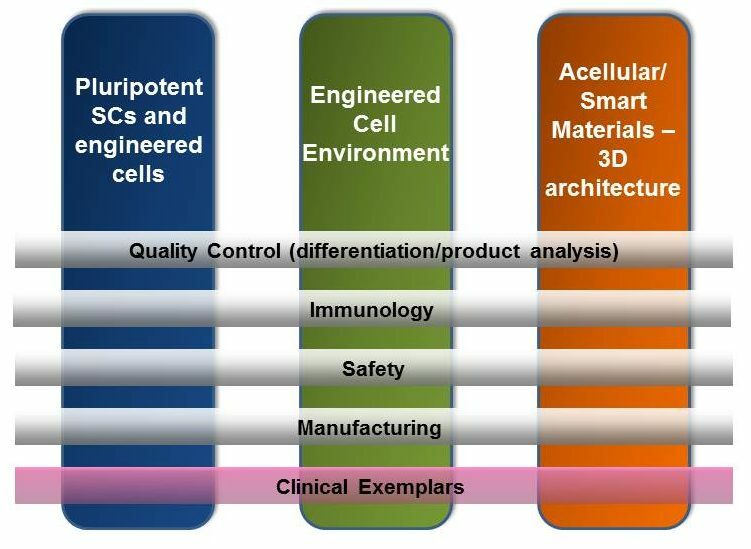 acellular/smart materials – to develop next generation scaffolds and biomatrices to support regenerative therapies, with particular focus on 3D architecture. The Platform should remain grounded in broad-based enabling technologies rather than direct pursuit of clinical trials. Therefore, the clinical exemplars on which each Hub focuses should be restricted to areas ripe for clinical intervention, i.e. moving toward the clinic within the next one to five years. The UKRMP Hubs will address one of the following themes which reflect the strengths and strategic opportunities identified through consultation with the UKRMP Programme Board and ideas elicited through the Challenge Ideas consultation. Aim of hub: To develop the approaches and technologies to provide well-defined and stable stem or progenitor cell lines with appropriate scalability and quality controls to meet the standards of regulators, and ultimately support manufacture for clinical application. The hub will identify routes and develop/utilise appropriate innovative technologies to underpin the supply of well-characterised pluripotent cells (including iPS and hES cells) that are homogeneous, genetically stable, and can be generated in a scalable manner suitable for their clinical application (using exemplars or specific applications). These technologies might include enabling technologies such as gene editing, cell engineering, synthetic biology or new physical characterisation approaches. Cell characterisation and stability: To address the establishment and maintenance of clearly defined or homogeneous populations of pluripotent and progenitor cells and understanding of their genetic and epigenetic stability. Protocols and high-throughput capabilities will need to be developed to detect variant cells in culture, and cell lines will require systematic, genome-level analysis and /or expression profiling to assess genetic/epigenetic variation during expansion. All approaches should be scalable with translational potential. Understanding routes to differentiation: To cover the induction of differentiation through the use of different agents or approaches, including understanding cell autonomous pathways, in lineages of relevance to future clinical utility. Approaches to deliver appropriate functionality / maturity should also be identified. Modifying cell fate in vivo: To exploit gene reprogramming and/or cell engineering approaches to enable or improve regenerative efficacy in preclinical models. Manufacturing; this encompasses the scalable expansion of cells and materials with desired properties towards the final product form, as judged by the use of appropriate markers and physiologic traits. This will require the establishment of, for example, suitable reporter technologies and selection/purification processes which are scalable, reproducible and have the potential to be ultimately GMP-compliant. Close working with regulators will be essential to establish the suitability of the manufacturing processes and measures. Post-production issues, such as cryopreservation, product shelf-life/viability, shipping and GMP production itself, are NOT considered priorities for this Hub; rather they represent downstream issues that should be approached through other funding sources. Aim of hub: To develop novel approaches to better understand and exploit the stem cell ‘niche’ in order to deliver functional cells of therapeutic value. The development of effective stem and progenitor cell–based therapies is likely to require the exploitation of knowledge of the relevant stem cell niche (or microenvironment), given its role in guiding the processes that regulate and differentiate tissue-specific stem cells in vivo. Cell/biomaterial engineering strategies capable of reconstructing or dissecting elements of the niche might also provide novel approaches for enhancing differentiation protocols to provide and/or validate cells with appropriate functionality for regenerative therapies. the development of niche-based biologics, small molecules and engineering solutions as a basis for regenerative therapy, either to stimulate endogenous repair processes or to help deliver and engraft progenitor or differentiated cells in vivo. the promotion of successful engraftment for transplanted cells/tissue at the target site of intervention, including the role of revascularisation in supporting regeneration and consideration of host immunological responses. Aim of hub: To develop next generation scaffolds and biomatrices to support regenerative therapies. The overarching goal is to produce scaffolds which transform them from passive mechanical supports to active components of regenerative medicine manufacturing processes and therapies. The goal will be to prepare better optimised scaffolds over multiple length scales and in three dimensions and enhance scaffolds with bioactive molecules and cells to better understand how to harness external factors in guiding cellular propagation and differentiation to deliver appropriate function. Approaches to support cell functionality and engraftment as delivery vehicles, including strategies designed to improve blood flow to support transplants. £17M will be available for the Platform (with a possibility that this amount will be increased further). Awards for Hubs will be administered by the MRC on behalf of the partners and subject to MRC terms and conditions. Organising workshops relevant to the Hub’s theme (which shouldn’t replicate or replace existing meetings organised by other stakeholders in the field). This is not an exhaustive list, and bids to establish UKRMP Hubs will need to make the case for the resources they are requesting for networking activities, identified in detail for the first two years of the award. All networking activities must identify the key deliverables and associated dissemination activities, i.e. there must be a clearly defined output which will provide benefit to the wider research community. The programme of activity must be reported to the UKRMP Programme Board on an annual basis. Activities beyond the first 12 months of the Hub award will need to be approved by the UKRMP Programme Board. The normal MRC resourcing rules apply; please see the Guidance for Applicants – Resourcing. Funds cannot be requested for major capital and refurbishment costs or infrastructure and core administrative services (secretarial, finance, personnel, computing support, estates and building maintenance) covered by the indirect cost component of FEC. Funds cannot be requested for training awards, including studentships and fellowships. Funds cannot be requested to support clinical trial activity. Due to the complex nature of such applications, it is more appropriate for these to be submitted separately to other appropriate schemes offered by MRC and other funders. Strong leadership, through the Hub Directors, is a fundamental requirement for success of individual Hubs and the overall Platform. It is essential to drive the Hubs forward and ensure all members of the team are focused on the overall vision. Directors need to be both scientific leaders in their field but also be able to motivate their colleagues and constituent teams and take executive decisions where required to ensure the research objectives are met. For UKRMP2 this will be measured against a deliverable and milestone led framework. While the Director focuses on leadership, the Project Manager must be empowered with the authority and responsibility to ensure that the objectives of the Hub are achieved (in close collaboration with the Director and Co-Investigators). This must be balanced against other skills including, but not limited to, financial management (notably where remote partners are involved), experience in the use of best practice project planning and management approaches and the ability to liaise with researchers at all levels within and across Hubs. As such the remuneration package for the project manager must be commensurate to attracting and retaining an appropriately skilled person. The leadership skills needed to drive the research programme forward will primarily be assessed at the interview stage with the sponsors and Programme Board representatives. Submission of a Challenge Idea used in the development of this call is NOT an eligibility requirement. For administrative purposes, the UKRMP2 application will be led and held by a single UK academic institution or independent research organisation eligible to receive Research Council funding. Only one proposal as Hub lead is permitted per applicant institution; however, involvement as a partner on other bids is allowable. The Director must be the principal investigator on the proposal and be given appropriate status within the lead host institution to facilitate leadership and development of the Hub’s activities. The Director should be in a position to influence research programmes associated with the Hub, and must have full control over use of Hub funds. Demonstrable leadership capability and ability to delivery against objectives is a key requirement. Co-investigators are expected to be the leading scientists involved in delivering the Hub’s aims and objectives. The normal MRC eligibility rules apply; please see the Guidance for Applicants and the Research Council UK website. Partnerships with industry are encouraged. Applicants considering establishing collaboration with an industrial partner(s) are advised to refer to the guidance on MRC Industry Collaboration Awards (MICAs). All Hubs are expected to have negotiated and signed collaboration agreements with their industrial (project) partners prior to the start date of the grant. ALL applicants are required to discuss their proposals with Dr David Pan, UKRMP Programme Manager, before submission. A brief abstract (Intention to Apply) of not more than 2 pages should be e-mailed in advance of discussions. The purpose of the abstract / intention to apply is for administrative purposes only. This will allow the office to ensure that proposals are aligned with the remit of the call. No feedback will be given other than confirmation that the proposed bid is within scope and can be submitted. Abstracts should be top level and provide the underlying objectives and identify lead and key partners. It is recognised that final proposals are likely to continue to evolve up to the application deadline. Therefore, although the full proposal must fully reflect its core elements, the final application need not be restricted to the precise description provided within the initial abstract. Abstracts must be submitted by 4pm Tuesday 13 June 2017. The call will be supported by an applicant workshop to provide information and answer queries relating to the call, to be held in London on 3 May 2017. Registration details for the workshop are available from ukrmp2.eventbrite.co.uk; the password to register is UKRMP2. Applicants will submit proposals through the RCUK JeS system which must be led by UK institutions eligible to receive RCUK funding. The deadline for full applications will be 4pm 20 July 2017. Specific instructions for completing the case for support are detailed in the Application Guidance. Proposals will be reviewed by experts and prospective Directors interviewed before consideration by the UKRMP Programme Board in November 2017. Final funding decisions will be made by the contributing funding partners represented through the UKRMP Executive Group. Awards will be announced in early 2018.
a plan for longer-term sustainability beyond the 5-year award. In addition to the standard MRC and RCUK terms and conditions, applicants undertaking research involving human stem cell lines must adhere to MRC supplementary terms and conditions for MRC grants introduced in the context of stem cell research – see MRC additional terms and conditions: section AC13. Hubs will be required to annually submit reports to researchfish©; (formerly MRC e-Val). Further details are available from Dr David Pan.